A quick five years after its journey began, a Holstein, Iowa, door-maker’s quest to find new alternatives for one of its products has morphed into a massive new business and a new company-owned recipe for producing fireproof doors. 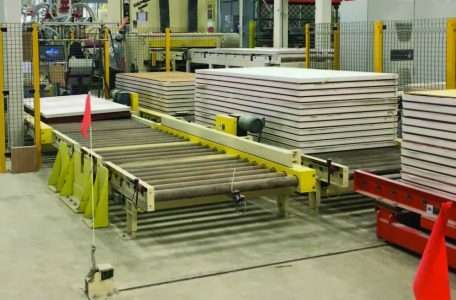 VT Industries has been making doors and countertops since 1956. The family-owned company used to purchase the fireproof core for its commercial doors from an outside supplier. But VT officials decided in 2013 that it was time to investigate a replacement for the fireproof substance. Company engineers reached out to CIRAS for suggestions. CIRAS project manager Shankar Srinivasan said VT began with an open mind. Leaders just wanted the new substance, whatever it might be, to meet safety requirements and be easier to handle than the previous mineral-based material. Srinivasan eventually compiled technical information on five potential new materials. VT officials selected one and began their own research process—something that expanded significantly when VT later purchased Clarksville-based Creative Composites. What followed was several years of refinement and periodic CIRAS-arranged tests (including work by CIRAS project managers Paul Berge and Adam Boesenberg) to make certain that everything was able to perform as it must. 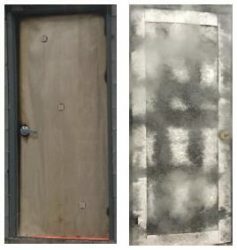 Photos from lab testing show a VT door from the side away from an in-progress fire (left) and after the fire side was sprayed with an extinguisher. In 2015, VT built a new $10 million factory in Clarksville and hired 12 people to start making the new substance—both for use in VT’s fireproof doors and for sale elsewhere in the construction industry. Combined, the company estimates that its work with CIRAS has had an economic impact of more than $24 million over the last three years, including at least $2 million in new sales. Cordell Burton, director of engineering for VT Industries, said CIRAS helped put his company on the right track and provided needed expertise along the way. > To lean more about tech scouting, register to attend an educational event on the topic scheduled for October 25 in Carroll. Or, contact Shankar Srinivasan at srigshan@iastate.edu or 515-290-6702. A version of this article was published in the Summer 2018 edition of CIRAS News. To read more of that edition or others, please explore elsewhere on our website.